When traveling on our walking tour through Puglia, the “heel of the boot” of Italy, food is everywhere. Beneath majestic olive trees, there are fields of red earth planted with vegetables, and the night air smells like celery. Long expanses of wheat fields produce the local flour used in excellent crusty bread, and then there are the raucous fish markets, teeming with wriggling sea creatures. And we haven’t begun to get to the exquisitely creamy burrata cheese, the oh-so-sweet tomatoes, or the heady Primitivo wine, thus named because it describes your ability to make a sentence after a few glasses. On one occasion, while traveling through Puglia with friends, we stopped in a bar in Martina Franca to have an aperitivo, and the waiter asked if we wanted stuzzichini – appetizer snacks – with our drinks. When we said yes, out came bowls of soft bocconcini of mozzarella, plump green olives, oven-baked black olives flecked with hot pepper, bits of salami, tiny one-bite pizzette, pickled lampascioni, sun-dried tomatoes, and crunchy taralli, spiced with fennel seeds and black pepper. In other words, a meal for most people. When we commented to the waiter about how this could suffice as dinner, he laughed and said, “Only if you aren’t pugliese.” And so, wanting to fit in with the locals, we headed off to dinner. We found more taralli in the breadbasket at dinner, and they became our addiction during the trip. Taralli are quite simple to make, with an unleavened dough of flour, salt, extra-virgin olive oil, and white wine. You can leave the dough plain or spice it with fennel seeds or cracked black pepper. Take walnut-sized pieces of dough and shape into thin ropes about 5 inches (10 cm) long, then bring the ends together to form a ring. It’s okay if they look like a teardrop. Place the taralli on a cookie sheet lined with parchment paper and bake until the taralli are golden brown. Cool on a rack and serve with an aperitivo – drink the rest of that white wine you used to make the dough – or fill a breadbasket and serve at dinner. Read more about where we’ll be going on our Puglia Walk, an easy walking tour with fabulous food! i made this recipe today and they turned out great! i made plain, fennel & pepper ones. dead easy to make just needed to add a bit of water to dough as was a bit dry. @Tina – So glad to hear that you made my taralli recipe and they turned out well! Flour can differ from place to place, but it sounds like you got the right consistency. Do you have a favorite flavor of the 3 you made? that had the Xanthan Gum in it.I fallowed the directions. I had trouble because the dough was sticking together . Instead of throwing the whole thing away I figured that if I mixed two eggs in the dough it would stick together . It worked the Taralli came out good and delicious. I’m writing this because if there is anybody with celiac , they can enjoy the Taralli too. I don’t know if the stores sell Gluten free Taralli. If they do, I’m sure that they are expensive. Glad this worked out for you Anna, and thanks for the info! We just returned from Puglia where our guide gave us her recipe for these. She did not mention the boiling step. Have you ever made them without boiling before baking? I made these today and I love them! I lived in Rome for a year and am addicted to these. They are easy to make however I found them a bit heavier than the store bought taralli. Any ideas why? Diane- Glad to hear you made the taralli successfully. If they were a bit heavy, try cutting back on the flour, as the dough should be soft. Buon appetito! Born and raised in Trani, Puglia, I know taralli. Plain all purpose flour – not bread flour. What kind of flour for these tarralli ? All purpose ,bleached,unbleached? Doesn’t matter. thank you for the taralli recipe, its what I”ve been looking for. Im so excited I cant wait to make them, will let you know how they turned out. My grandmother is from Bisceglie in Puglia. She made taralli every year at the holidays but used a yeast dough as we still do today. Our family taralli are coveted by our friends and family. Rie- I know some recipes call for yeast, but mine does not. In Jerusalem there is a little snack like this- called beigele-for lack of anything better. A big fatter, but more or less the same. Enjoy, everyone, whatever the version. I have been making boiled pepper biscuits for a long time ( 85 years old) the way my sainted mother taught me. In her recipe she used yeast. I notice that there is no yeast listed in your version. Does this recipe require no yeast? Had these growing up and remember watching my mom and aunt with the pot of boiling water. we called them salt and pepper cookies. so glad i now have the recipe and make them for myself. i did find a bakery in NJ that makes them. I made my first batch over the Holidays, and they turned out exactly lie the ones I remember from an Italian deli in elm wood park, Illinois. Today I am going to make another batch and send them to my 96 year old father in law. The hints about the moisture vs dryness were really helpful ; I live in the southwest and a little bit of extra wine and oil made them perfect! Thanks! Becky- Glad these taralli brought back such good memories. And hope your 96-year old father in law enjoys his batch! Roni- You proabably did not bake them long enough or you had a dough that was too soft. Hope they still tasted good! Wow, these are clearly difficult to mess up, YAY!! I have been buying store bought tarallis that me and my 2.5 year old love. Being someone who is always trying to make things healthier, I decided to try a half whole wheat version. So I used 50% whole wheat pastry flour and 50% organic white spelt flour – the dough was too dry, but I kept kneading and kneading 🙂 only to realize after letting it sit for 30 minutes that it was truly too dry to stay together when rolling! So I sort of crumbled it all up again, randomly added extra oil and wine and kneaded a little more, then followed the rest of instructions. They turned out perfectly!! Great texture. I used fennel which I love. Can’t wait to see how my daughter feels about them. Next time I want to try some spicy ones, dry chilli pepper? Thank you so much. My 4 year old and I are rapidly finishing the first bag I ever tasted and brought home from Italy yesterday….. Glad my quick thinking brought me here, LOL! I have to start baking before my little one goes into withdrawal! Thanks!!!!!! Get in the kitchen and start baking, Gwen! 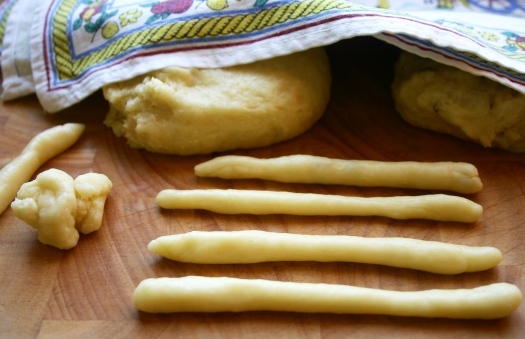 I am sure your 4-year old will enjoy your homemade taralli, too. hi.. i loved this recipe.. i would like to know is there any substitute for white wine.. because dont take alcohol in any form. And whats the difference between bread flour and plain flour. pls help me. hi.. i loved this recipe.. i would like to know is there any substitute for white wine.. because we dont take alcohol in any form. And what is the difference between bread flour and plain flour. pls help me. You might try using a bit of vinegar or lemon juice mixed with water instead of the wine. Bread flour has morre gluten, but using plain flour is fine. Let me know how they turn out! ” … Because don’t take alcohol in any form … “. By the time the taralli are boiled AND baked there will be no alcohol left. Ethanol evaporates at a lower temperature than water, so if you have dried the taralli the amount of alcohol remaining will be undetectable. Do you use artificial vanilla, other flavorings? They virtually all have alcohol, but the same principle applies. By the time your food is cooked the alcohol has evaporated. Making these for my Italian Appt Table!! No Yeast? This recipe has worked well for me! i am italian, born in Canada, and these are one of my favourite italian snacks! theres a great italian grocery and cheese factory in Toronto where my family always go to, and we’d buy Taralli by the pound, all different flavours….but now i live in Germany and in the town i live in there arent many Italians, so i cant find all the delicious italian treats i crave. so i stumbled on this recipe and thank god i did. they turned out so so fantastically, that ive made several batches in the last few days using fennel seeds, caraway seeds, crushed chili…ive even experiented with a bit of tomato paste mixed with drived basil and oregano for a sort of pizza flavour like i used to find at that grocery in Toronto and they all worked out amazingly!. they are delicious and just exactly what i needed in my home-sick state! thanks for posting!! Just back from Italy and found your recipe just as withdrawal was setting in. Do these freeze well? I’d like to make a huge batch to have around for drop-in company. I have never tried freezing them becuase I eat them so quickly, but don’t see why it wouldn’t work. Happy baking! I loved these little snacks I discovered in Puglia. Great article and thank you so much for the recipe!! I will give it a try! Since returning from my very first trip to southern Italy, and have tasted the taralli from the Naples region, I have been obsessed with discovering the one “true” taralli – that is a taralli that isn’t almost precisely a bagel, but is rather more of a lighter, almost biscotti result. I am dying to try your recipe. Until our Italy trip, my only prior experiences with taralli were with my family. Theirs were always completely hard, like a cannon ball. I also knew of no taralli recipe in which they were prepared unleavened. As a child, I had an aunt that made her version of taralli at every Easter. We kids used to scatter to the four winds whenever she brought her taralli to the family Easter table. Those horrible things didn’t even dissolve when dunked into boiling hot coffee! When I tasted taralli in Naples, and I begged the bakers to share secrets, I learned all of them made these wonderfully different treats alike. Theirs were made with wine and no yeast. I am going to try my own hand at resurrecting the venerable taralli to our family table. Your recipe looks closest to what I was able to learn from my trip. Oh, one tip – the local Neapolitan bakers added crushed hazel nuts to their recipe. I guess hazel nuts are a big part of southern Italy baking, and a tasty and wonderful addition. I was just in Italy last month. I am so addicted to these. Can i make these with the white wine? Guys!! Try to flavour them with rosemary, just brought back some from Italy! They are delicious! I love your site. I’m from Foggia, Puglia. A little town called Bovino. 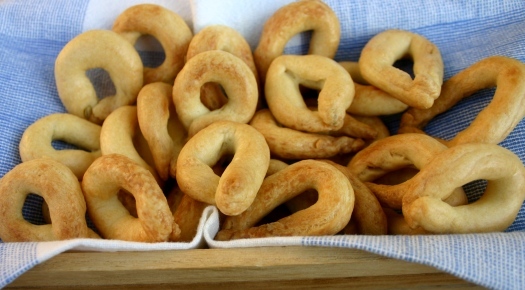 My Mom and Grandmothers and Zias make these amazing taralli but use flour, melted shortening, eggs, sugar, and a shot of whiskey to in the dough. Have you come across this recipe? I love dunking these babies in red wine. A tradition at our house still today. Thanks for sharing. D.B. My mother used to make Taralli, but I don’t have her recipe. In the stores there are 2 types: One is crispy sort of like a cracker. The other is hard and crunchy. These are the ones my mother mother made. Finding this variety in the stores is rare. I like them so much better than the cracker type. Does your recipe come out like a cracker or hard and crunchy? Hi Laura, Glad to hear that with perseverance you got the right texture that you wanted. Enjoy the crunch! @ Renee — no, no yeast. My Grandma and Mother made this recipe for years, and they turned out fine with no yeast. Want to make these with my adult children. A fond memory, a delicious treat! Jersey girl relocated to rural Virginia. NO taralles here! Thanks, they are just what I needed! My grandparents came from Bisceglie in the early 1900’s and my Nonna brought many recipes with her, this included. My Mom, who just passed away last year at 92, always made taralli to perfection. I always helped her and have our family recipe. 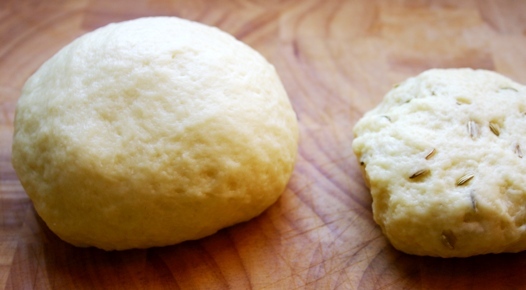 We always use anise seeds and have yeast in the dough. Lots of good family memories. Anitas I love your tarralli. I make the same way you recommended and I have made with dry garlic and dry basil, another dry onion it they are delicious. I only have one problem is they stay golden when they come out but some of them get tuff. What do you recommend I do. Also I have seen a italian video making tarralli and they add white vinager to the hot water before putting in the tarralli do you know what does the vinager to to the Tarralli? I have never used vinegar and mine come out fine, so don’t know the vinegar’s purpose. I tried the taralli recipe today and they turned out lovely! I made four kinds: fennel, nigella, pepper and plain and liked the nigella best. Thanks so much for sharing the recipe, I’ll definitely make them again! Sorry, can’t help you out on this one. Maybe try a bagel recipe? Just made them and I love them. Though had to bake longer than 25 minutes. Glad they turned out well. Everyone’s oven is different, so it make take longer to get the results you need. i made the recipe but used 3 1/2 cups of flour and 1/2 cup of olive oil. the dough was soft and easy to work with baked them with 360 F oven took about 30 minutes to become golden but the taralli came out a bit too hard any ideas why? As I read your recipe my head kept remindng me that is exactly what my mother did. Almost brought tears to my eyes. She was from Trani, Italy a province of Bari. Thank you for a wonderful memory. My son is just getting through making a batch. Trani is a lovely town – I am glad this recipe brought back good memories. Just made it and very good indeed. Thank you for sharing recipe. * I baked for 30 mins on 375 F than 10 on 350 F than 30 mins on 250 F. That helped to make them very crispy inside as well. That’s a long time to bake them, but I am glad they turned out well. My mother was from a town near Bari, Palo del Colle. I grew up eating Taralli. Mom called them,” biscotti”. Have made them in the past but forgot them as I grew older. 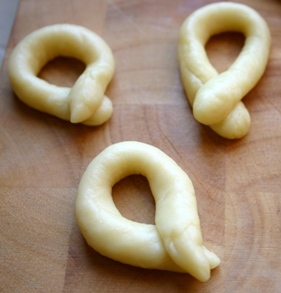 I stayed for 2 weeks in Puglia earlier this year and loved the taralli so thank you Anita for the recipe. 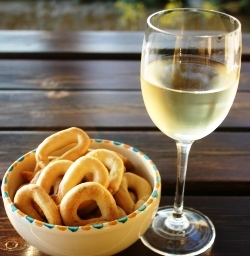 I have been making it with water to mix (as I don’t often have wine) and the taralli have been just as good. Today I am experimenting using some beer to replace the wine as I had a small bottle in the fridge. The dough looks good so far. I will report on the flavour later. Thanks Toni – If you make these, let me know how they turn out! I am 2nd generation Italian and lived in an Italian neighborhood growing up in New England. Our neighbor, directly from southern Italy (don’t know the exact location), made Taralli (we, who were born in the US, always pronounced them as “thralls”, lost something in the generation and Italian language). They were bagel like as well as others were thinner like what you describe on this site with spices. The bagel-like ones were very puffy egg-like color center and almost hollow like a croissant, but firm and crunchy on the outside. I only recall one thing about the recipe that they were boiled in water first (nothing was written down and always made my our neighbor’s “Noni”). They were an Easter treat and coated with anise flavored powder sugar glaze with colorful sprinkles on the glaze. Baked fresh they were great for eating as is, but older/stale, they were hard as a rock and could only be eaten by dunking in hot coffee. You’ve brought fond memories to me with this site and your recipe. Thank you and may God bless you! I have made this recipe a few times and they taste great. My mother-in-law from Calabria made them without wine and with yeast and they were a little lighter. Do you have a recipe like that? Would yeast add any rising to this recipe? Our family recipie is very similar. My grand parents from Faggia made these starting in the fall every year in the 50’s. My mother with her family of 10 morphed the recipe using 5 lbs of flour (usually unbleached Cerasota), 1 cup of EV, 2.5 tbsp salt, 2.5 tbsp black pepper, 3/4 cup Fennel & 4.5 cups water. We made 2 batches this year and they are all gone. Your recipie is the first we’ve seen similar to ours (boiled then baked just as you described). All of the others I have had are not as good (addicting). We sometimes make them as a group effort with friends and neighbors. Its a great social activity. Is there a taralli that is made with shortening and has more of a pastry-like texture? I had something in Naples last week that had blanched almonds and maybe cayenne pepper but I could have sworn the receipt said taralli. Thank you. I have recently got into bread baking at 70, and after a trip to Italy where we tried shop bought Tirallis. It was suggested I tried making them at home and I found your recipe on the internet. Great success, I made half fennel and half black pepper which my wife said tasted far better than bought ones and also gave a good excuse for opening a bottle of white wine to have with them. Had these in Umbria a month ago – so delicious – but they were flakey, almost like a flakey pie crust – but not tender, and quite crunchy. Any thoughts about how to get the flakey quality? Very excited to try this recipe! We’ve just returned from Italy where we’ve done a bit a taralli tasting – buying different types in different towns, in different markets and have become obsessed. My dad, who lives there turned us on to them. Now, the one bag I brought home is dwindling and I need my fix! I used to ate them in Mar del Plata Argentina, It was a family recipe, so I always depended of my old aunties to do it for me. Today a cousin past me the recipe and at the same time googled it and found it yours. The recipes are the same so the tradition all over the world carries on! I noticed that your recipe doesn’t call for any yeast. What type of flour are you using? All purpose flour works just fine. Absolutely delicious! My husband tried one and said, “If I didn’t know better, I would have said they were shop-bought!” Che meraviglia – and so easy to make! Can I just add a couple of points? 10 grams of salt is equivalent to 2 level teaspoonsful… and the mix benefits from resting for the suggested time, but then being put in the fridge for half an hour or so. When draining, move them from the teatowel (after drying) to the baking tray as soon as you can, because I found they can stick to the tea-towel…I added some chilli flakes to the mix and there’s this wnderful ‘warm’ after-taste that tingles in the mouth. Once baked, I left them in the oven, but turned the oven off, then removed them 10 minutes later. Perfect gifts for Christmas nibbles! Perfetti e Ottimi! COMPLIMENTI!! I have made them before with unbleached all purpose flour and they were just not quite right. I have seen recepies with that and 00 flour, or similena flour and 00 pizza flour. I was curious about the flour used in their recepie. I use either 0 or 00 flour, so all purpose should work fine. Just came from Albero bello Italy and tasted these wonderful tarrelli , we even got some back home ( Malta ) with us . I looked for the recipe and found yours , will definitely try them out . Thanks a million. I followed the recipe and they turned beautifully. Couldn’t stop eating them. Will definitely make them again. Looked high and low for a recipe like my aunt made. This is it! She,and now I, use both fennel and black pepper. Found I needed to add a little more wine for the right consistency. We had them for holidays before dinner with a glass of wine. I now carry on that tradition. Hi, can the dough be kneaded in my kitchen aid stand mixer and for how long? These look so good, can’t wait to make them! I don’t have a stand mixer, but I think it should work – let me know how they turn out! I do not own a stand mixer, but think it would work, just don’t overdo it! Do you not use any Yeast in this recipe? I have seen most others list this. This recipe works fine without yeast – try it and let me know! I love this recipe. I made a batch with and without fennel. Fennel made them so delicious. I used Proseco since I did not have any white wine, and they came out very nice. I liked them so well that I’m making another batch, and I’m adding an amaro to the mix to see what happens. The dough seems much softer this time around, but it is still sturdy. So glad to hear that you have had good results with this recipe, Vicki! I can’t wait to make these but I was hoping to cut the recipe in half. Can I do that ? Hi Bridget – While I haven’t tried to do it, I see no reason why you can’t halve the recipe. Let me know how they turn out! This is my third time making them. Hi Tony – I am so glad that you have made these taralli successfully, and glad that they brought back good memories for you. These were so much fun to make! This was my first attempt making these and I was worried that it would make too many, but I think I will have to make another batch soon as they didn’t last too long! I pulled all the spices from my cabinet to try different combinations – black pepper, garlic, caraway, rosemary, cumin and chili powder, curry, even a few cinnamon and nutmeg ones – all were delightful and tasty. Thanks for sharing this recipe and I know it’s going to become a regular in my kitchen. So glad to hear that you had fun making these – it sounds like you were very creative in using spices and they all sound delicious!